In a 1931 article for the Musical Quarterly Percy Grainger urged "all forward-looking" musicians to abandon the summer festivals at Bayreuth and Salzburg and instead frequent Arnold Dolmetsch's Haslemere Festival where they would learn the skills of early music "that so soon will become a necessity to any self-respecting musician". Dolmetsch's festivals in Haslemere, England played a pivotal role in rehabilitating early music and in the last decade of the 19th century he gave the first performances in modern times on the instruments for which they were written of more than 500 works by early composers. He rediscovered the art of making recorders and is responsible for the popularity of the instrument today. Viols were acquired and refurbished by him for his pioneering early music concerts, and he went on to make lutes, clavichords and harpsichords. 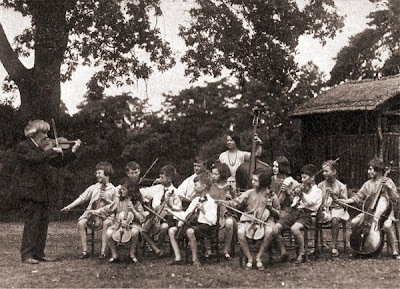 Music education was important to Dolmetsch; as well as teaching his own family his outreach activities took him into schools and my header photo shows him teaching at Dunhurst Junior School, Bedales - classical music has many saviours! The perfect Wagnerite George Bernard Shaw was an early champion of the comabative Dolmetsch who was married three times and bankrupt once. The early music pioneer refused to make James Joyce a lute and, because he was too busy, Segovia a guitar. When Dolmetsch, who was born in France, was awarded the Ordre national de la Légion d'honneur at the age of 80, he shrugged as if to say "About time too". Despite being dubbed 'the apostle of retrogression' Dolmetsch's influence spread far beyond early music. Marco Pallis, who was one of his pupils, became a leading authority on Buddhism, while - a little-known piece of music trivia - the potter Michael Cardew was an accomplished recorder player who played with the Dolmetsch ensemble, as well as being father of contemporary music enfant terrible Cornelius Cardew. Far from being an apostle of retrogression Dolmetsch was a man before his time, and the final sentence of his seminal 1915 book The Interpretation of the music of the XVIIth and XVIIIth Centuries carries an important message for our over-mediated digital age: "We can no longer allow anyone to stand between us and the composer". One of Dolmetsch's notable pupils was Suzanne Bloch who had a high profile career as a lutenist in addition to promoting the music of her father Ernst Bloch. For her lute recitals she followed Dolmetsch's practice of wearing period costumes and never used amplification, even when performing in cavernous spaces such as the Town Hall in Manhattan. Since Percy Grainger's exhortation to abandon the mainstream summer festivals Salzburg, at least has changed and now includes an Ouveture Spirituelle sacred music festival where, this year, a sequence by Hildegard von Bingen rubbed shoulders with a new commission celebrating a Sufi saint. Grainger's prediction that the skills of early music will "soon will become a necessity to any self-respecting musician" proved prescient but premature. Following the early music revival in the 1960s and 70s, performance techniques such as 'white' vibrato-less tone have found their way into music far beyond the 'early' genre. That early music revival also expanded the music market by providing existing audience with new and rewarding discoveries; which provides yet more proof that classical music's big opportunity is its current market. Recorder virtuoso David Munrow introduced a whole generation to the riches of early music through his Pied Piper BBC radio programme and his many records for EMI. Recording producer Christopher Bishop was the catalyst for Munrow's recording career, and he tells the story of it - and much more - in a radio interview with me that is now available on SoundCloud. The second paragraph of this fine post serves to bring again to my mind that the potential saviours of classical music are now about five years of age, if not younger. The blether of the likes of Max Hole is as big a waste of oxygen as I can imagine. The key is to expose children to classical music at the latest in their first year of school and thereafter. I do not mean teach music. Nor 'music appreciation' classes if that entails another sort of blether. Just expose. I can remember the first classical works I was conscious of hearing -- and listening to: Eine Kleine Nachtmusik, Morning from Peer Gynpt, Water Music...I was five and these were the among the works played as we gathered for morning assembly. I knew the titles and composers because one of the teachers had composed very large and colourful portraits with the basic info displayed on a stand by the stage. The works played must, of course, be carefully selected. In later years of schooling, there should, of course, be music lessons, but those should consist chiefly of simply listening, again to works carefully chosen. Let them listen, then ask if they have any questions. Every single adult who came to classical music for the first time through friendship with me wound up buying classical discs. Every one. A five year-old might get hooked by Peer Gynt for starters. A twenty year-old by the Tchaik first piano concerto. A fifty year-old by Sibelius fifth symphony. And some may not at all, of course. But simple exposure from a young age is the main key to the problem we have now. "The key is to expose children to classical music at the latest in their first year of school and thereafter." Agree entirely. I believe it is a big mistake to believe that classical music needs to be specially prepared, packaged and presented to "young people" to get them listening. This, IMO, assumes that the genre is incapable of generating sufficient appeal on its own merits. The most important thing, I think, is simply to avoid putting them off in the first place. I spent a fair amount of time with my grandparents up to the age of 11, in the late 1950s. It was not a particularly musical family, but they had a dusty loft with an old gramophone and a collection of shellac records which had belonged to my great grandfather. I have forgotten what most of them were and my parents foolishly threw them out when my grandparents died (which tells you something), but I know there was a fair amount of G&S, Wagner and Beethoven. No Mozart, as far as I can remember. I'd never been to a classical concert, it was simply "not for the likes of us" in my part of Yorkshire at that time, but I returned to classical music about 15 years later, having shown little interest in the 1960s pop surge in the meantime. I put this down to the seeds planted in the 1950s and, as a result, a degree of "immunisation" against the pressures and attractions of the pop industry. So-called music appreciation lessons at school played no part in this whatsoever.